Our company has been producing plastic products for over 20 years selling products mainly in the UK and Europe as well as different parts of the world. With offices in London and our own factory in Lithuania we are positioned in prime locations that give us a logistical and cost advantage to produce our range of superior products on time every time. The Vendiplas multi purpose pool trolley is a versatile product that is ideal for transporting swimming equipment in and around the pool area. The unit is mobile and stable with the use of braked wheels that allow for easy transportation and comes in a variety of sizes to suit your requirements. Custom sizing available. The Vendiplas plastic bench is a multifunctional hygienic product that is ideal for use in extreme conditions both outdoors and indoors. Versatile in multiple situations such as swimming pools, changing rooms, sports clubs, schools, kitchens and playgrounds. The benches are strong and durable, easy to clean and can withstand a maximum weight of 400kg / m². Standard sizes available, but can be made to any custom specification. The Vendiplas poolside noodle storage unit is designed to maximise storage for pool floatation noodles by neatly organising them in upright positions. The slatted base allows for water drainage and easy drying. The built in wheels allow for full mobility and storage around the poolside area. Available as a mini and full size unit. 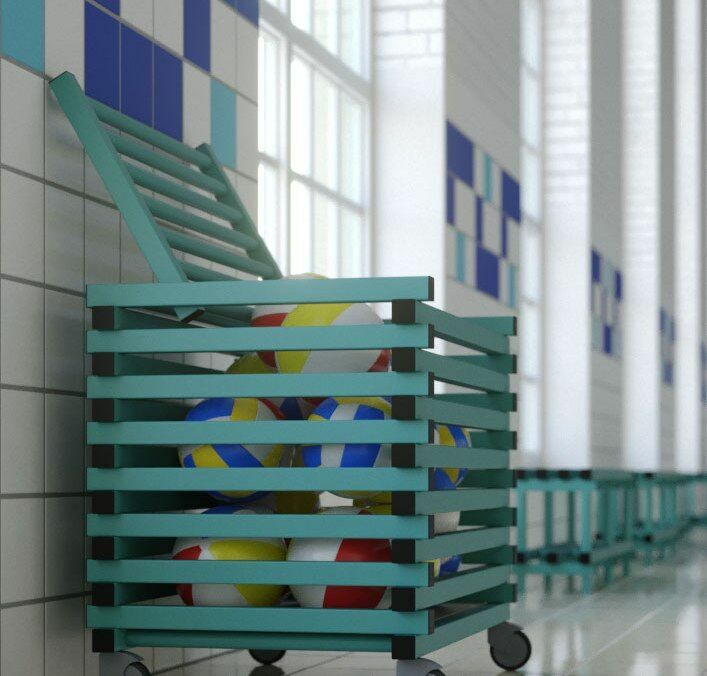 The Vendiplas mobile poolside storage trolley is designed to easily load and transport large floatation devices anywhere in the pool area. With the added storage boxes on top, surrounded by retaining bars allows for additional storage for smaller items and accessories. Available in 2 sizes. The Vendiplas double plastic bench with coat hanger and under storage is a multifunctional hygienic product that is ideal for use in extreme conditions both outdoors and indoors. Versatile in multiple situations such as swimming pools, changing rooms and sports clubs. The benches are strong and durable, easy to clean and can withstand a maximum weight of 400kg / m². Standard sizes available, but can be made to any custom specification. The Vendiplas poolside storage container with or without top cover is a purpose built storage unit designed to withstand the wet and chlorinated environment of swimming pools. This box can ideally be used to store all pool accessories such as balls, life vests, floats and pool toys. The unit is mobile and stable with the use of braked wheels that allow for easy transportation anywhere in the pool area. The container is available in one standard size and made to measure. The Vendiplas poolside equipment trolley is an all purpose multi shelf storage unit designed to store floats, life jackets, noodles, swimming equipment and all other pool accessories. The front gates provide easy access for lifeguards and swimming teachers to access all equipment used in the swimming pool. This unit can be customised to any size and internal specification. Available in 2 standard sizes with an option of a top rack. 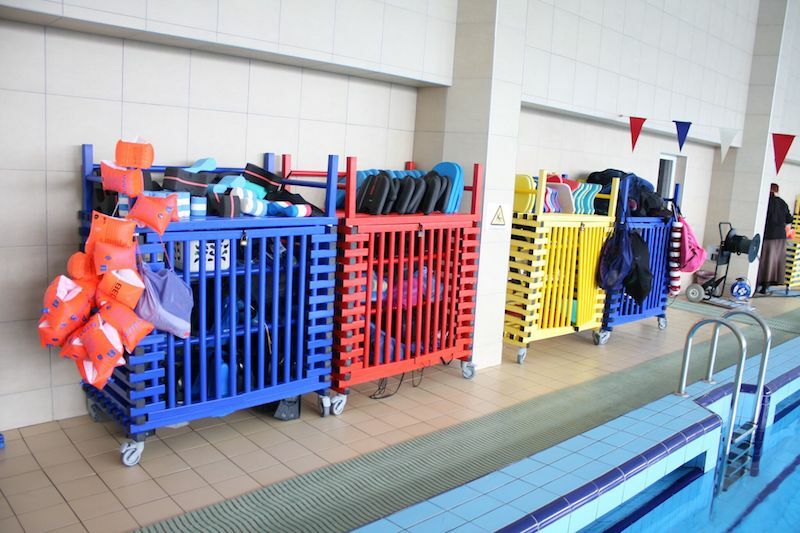 The Vendiplas mobile shelf unit is a lightweight yet strong, durable and multifunctional product that can be used throughout the pool environment. The shelf is manufactured from high quality, lead-free, non toxic plastic satisfying all industry hygienic standards. Fixing plates available to secure products to the ground and are inserted into the base of the unit. The adjustable foot, which can be inserted into the base of the unit allows products to be easily adjusted for uneven surfaces.